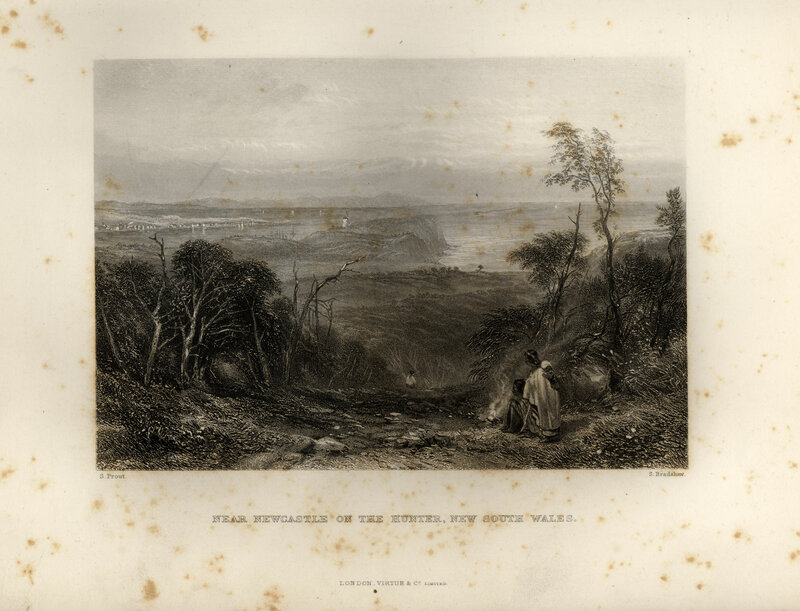 The engraving above entitled “Near Newcastle on the Hunter, New South Wales” is from an original work by John Skinner Prout (1805-1876) and engraved by S. Bradshaw. It was reproduced facing page 126 in Volume 2 of Australia by Edwin Carton Booth, F R. C. I. Illustrated with Drawings by Skinner Prout, N. Chevalier, &c. &c. London: Virtue and Company Limited, (1873-1876). Thanks to Ann Hardy who located and photographed this painting in the State Library of New South Wales. Item 6. 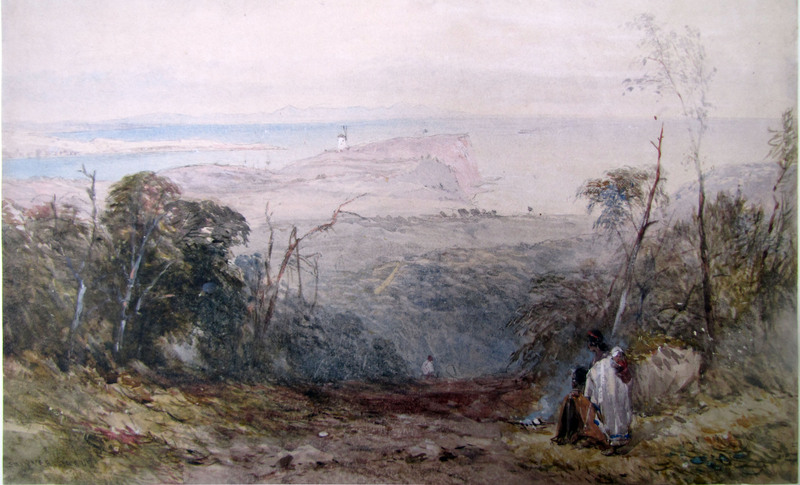 Near Newcastle on the Hunter River by John Skinner Prout. 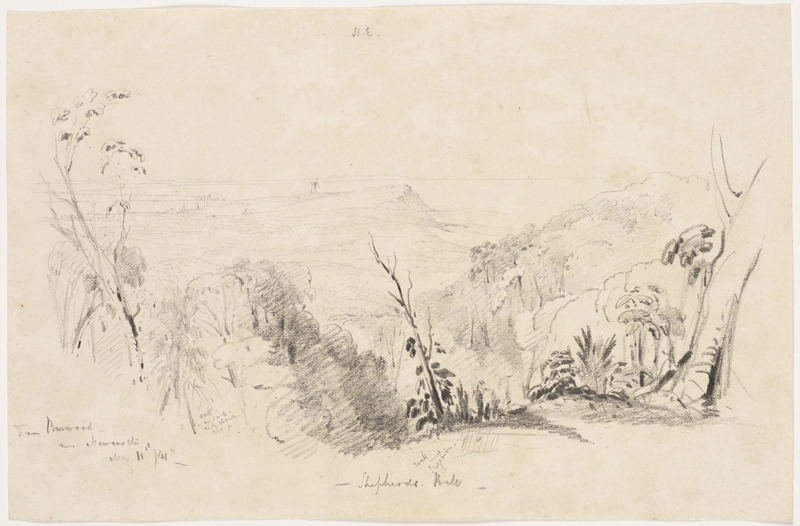 From the Album is entitled [Sketches in New South Wales, Victoria, Tasmania and Norfolk Island, ca. 1841-1847] Call Number PXD 75. At a recent meeting of the Government Domain committee, Ann Hardy noted that the hand coloured engraving of this same scene held in the Newcastle Art Gallery and photographed by Bruce Turnbull for the researchers at the University of Newcastle’s Coal River Working Party (see the image here http://www.flickr.com/photos/uon/4070494440/ ) could not be dated to 1874, as the windmill could be seen. The windmill was originally built in 1820, decommissioned by 1847 and replaced with the Obelisk in 1850 that stands on the site to this day. 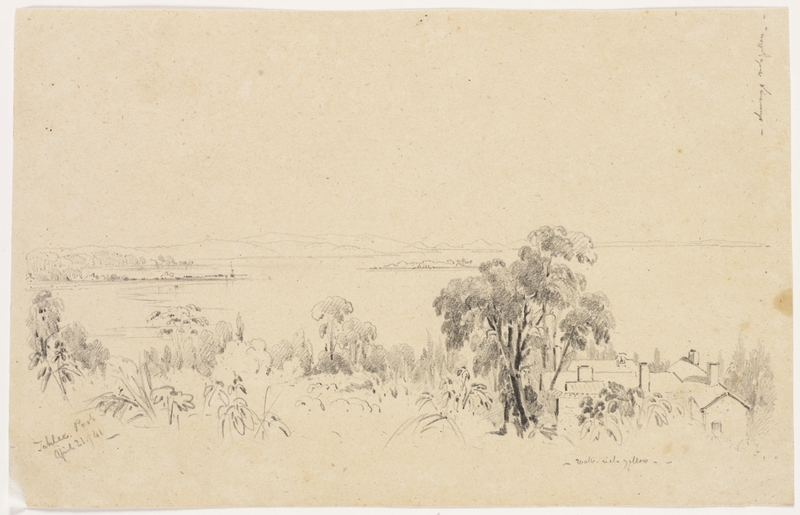 John Skinner Prout came to New South Wales with his family in 1840 and left again in 1848. His “Near Newcastle on the Hunter, N.S.W.” was made during that time and later published in volume seven of Australia Illustrated by Edwin Booth (London, 1873 – 76). It would seem that the date of publication by Booth has been taken as the date of creation. See Garry Darby, “Skinner Prout in Australia, 1840 – 1848”, Art and Australia 25, 1 (Spring 1987). An interesting comparison is with Conrad Martens, “From Burwood Near Newcastle”, which is dated 1841. Thanks to the Design Art and Australia entry on John Skinner Prout (http://www.daao.org.au/bio/john-skinner-prout/) we were able to narrow this period down to the years 1840-1844, which was the period he was resident in Sydney New South Wales. We have also found reference to him among the letters of Ludwig Leichhardt. Writing from Newcastle Leichhardt recommended John Skinner Prout (as “Mr Proud” or “Mr. Proudt”) as an art teacher for John Murphy, a plasterer living in Castlereagh Street Sydney. His letter is dated 11 October 184(2). He writes another in December 1842 checking up on how the lessons are going. Leichhardt was based in Newcastle from September 1842 – c.April 1843, so it is possible that they may have met during September 1842 or earlier. 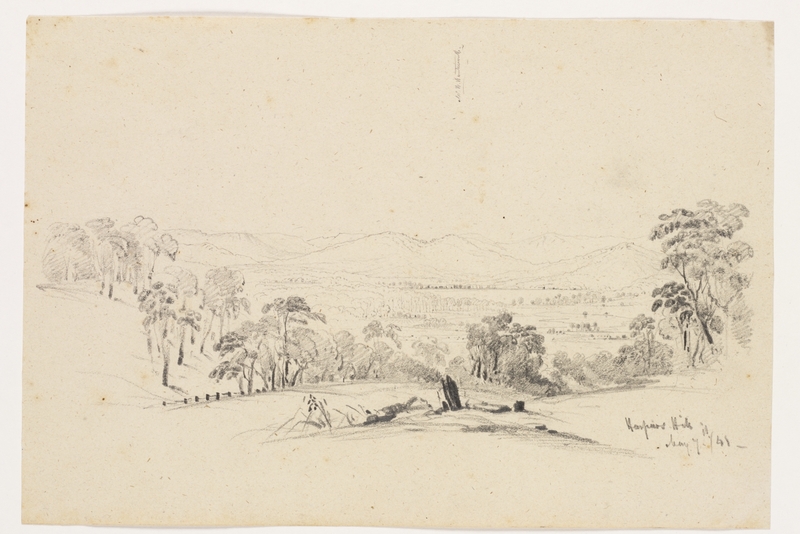 Comparing the image above with the pencil drawing by Conrad Martens held in the Mitchell Library and dated the 11th May 1841, we can see that the scenes are almost identical except for the Aboriginal people inserted into the work. 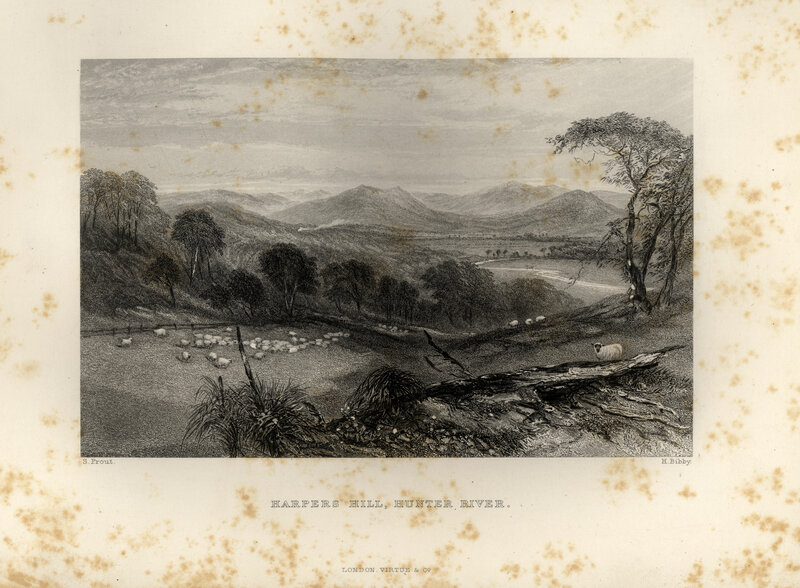 Martens records the location as being “Shepherds Hill From Burwood near Newcastle”. As we can see the images were drawn from the same locations. Prout adds details such as sheep, kangaroos, but the locations are essentially the same. 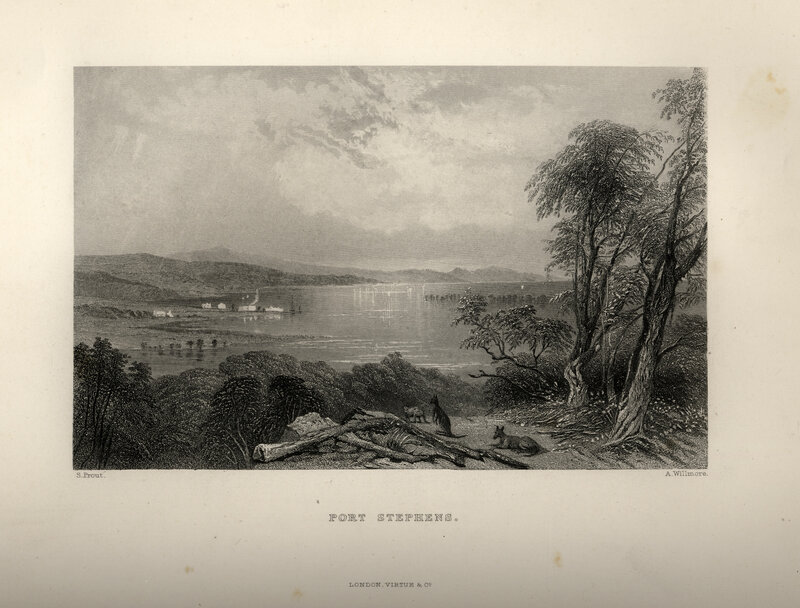 So we can be confident that the Newcastle, Harpers Hill and Port Stephens scenes were those taken on the spot in the 1840s, and later engraved for publication in the 1870s. Whether both Prout and Martens were companions on these excursions is also open to further discussion. Here are the sequence of plates with the accompanying text from Australia by Edwin Carton Booth, F R. C. I. Illustrated with Drawings by Skinner Prout, N. Chevalier, &c. &c. London: Virtue and Company Limited. Australia by Edwin Carton Booth, F R. C. I. Illustrated with Drawings by Skinner Prout, N. Chevalier, &c. &c. London: Virtue and Company Limited., Volume 2, Page 127. Port Stephens from Australia by Edwin Carton Booth, F R. C. I. Illustrated with Drawings by Skinner Prout, N. Chevalier, &c. &c. London: Virtue and Company Limited., Volume 2 Plate facing page 129. Australia by Edwin Carton Booth, F R. C. I. Illustrated with Drawings by Skinner Prout, N. Chevalier, &c. &c. London: Virtue and Company Limited., Volume 2, Page 129. CLARENCE. – THE RlCHMOND. – THE FAR NORTH OF NEW SOUTH WALES. agricultural country, for the most part low-lying and subject to inundation. Newcastle is pleasantly situate on a gently-rising hill, and on the ridge by which it is capped, on the south bank of the Hunter. Below the town, and at the mouth of the river, there used to be an island (Nobby’s Island, it was called, and strange stories of a convict who resided there are told), now connected with the mainland by means of a breakwater, of considerable use and value to the shipping visiting the harbour. Some idea of the importance of the shipping interest of Newcastle may be gathered from the fact, that nearly eight hundred thousand tons of coal are annually shipped from the port. In a very few years there is little doubt but European exports will be made direct to Newcastle, instead of having to undergo all the charges and cost consequent upon re-shipment at Melbourne or Sydney. To the geologist the neighbourhood of the Hunter is of surpassing interest. Ferns of exceeding beauty are found throughout the entire measure of the coal beds, and specimens of fossil flora are to be met with in every direction ; and although marine fossils are rare, they are only sufficiently so to make the search for them a pleasant one. at a little distance, from the sides of which the floods of winter rush upon the plain below, giving it the appearance of an inland sea. These floods occasionally do damage; but they are also the cause of the richness of the soil. The quality of the deep black loam held by the farmers of the district may be judged from the fact that it is no unusual thing to cut half-a-dozen heavy crops of lucern from the same ground in the course of a year, and this for a long series of years. East Maitland was the first laid out township of the name. The site chosen was a pleasant, but in almost every other respect an unsuitable one, and nearly all the material prosperity of the place is centred at West Maitland, about a mile and a-half away. Here there are flour-mills, tobacco manufactories, numerous large business establishments, and public buildings, the original town, however, retaining the public offices and the assizes of the district. It boasts also of one of the best horse and cattle markets of New South Wales. East Maitland on horse-sale day is a scene of great bustle and excitement of a thoroughly Australian character. Breeders and buyers meet together and make as motley a group, as full of life and spirits, as keen and shrewd, as any similar gathering in Yorkshire could furnish. One of the most interesting industries of New South Wales has been established at the village of Waratah, about four miles to the north of Newcastle. The manufacture of a common kind of pottery has been carried on for some time, and, from the quality of the clay discovered, great things are expected, when skilled labour is brought to bear upon the industry. This is one of the many openings that exist, in plenty, all over Australia for men with technical knowledge and means to develop the resources of the country. One other of the products of the Hunter River has recently been utilised, and promises to lead to the establishment of a valuable field of labour. Reference has already been made to the crops of maize grown at various points on the river. No ordinary field of Indian corn would give an adequate idea of the exceeding richness of some of the forests-for forests they are-of standing grain to be seen hereabouts. The plants rise up – straight and strong, and stand, some of them, eight feet high. For many years the cobs were gathered, and the immense mass of green stalk that supported them left to cumber the ground. Sometimes they were thrown to the cattle, often they were burned, and generally they were looked upon as a nuisance. Lately, however, an attempt to turn this mass of matter into money has been made, and the attempt promises to be successful. material in Europe, led people to think of the great waste of fibre consequent upon the ordinary method of dealing with the maize stalks. Several attempts at paper-making from maize fibre were made in the colony, but the high wages rate and the want of proper appliances prevented the experiment being carried out to any very great extent. This partial failure had, however, one happy effect. The freight charges upon so light a material as is the maize fibre, made it almost impossible to export it in its natural state, or at any rate to do so with a profit. The idea of reducing it to pulp, drying it, and then by hydraulic pressure bringing it within convenient limits, was acted upon, and with considerable success. When cleaned and dried and pressed, the fibre can be shipped at the lowest possible rate of freight for dead weight. Indeed, so far as the material itself is concerned and its safety on the voyage, it might almost be shipped as ballast, for no amount of ill-usage, short of actual saturation with water, could have any appreciable effect upon its quality or condition. It packs as tight and lies as close as so many blocks of granite; yet, on being subjected to a proper and very simple process, it becomes a pulp adapted in every way to the purposes of the paper-maker. After a few years papermaking will doubtless be one of the established industries of the Hunter, and in the meantime the export of the compressed pulp adds to the material advantages of the district. Among the other things that tend to increase the importance of Newcastle may be reckoned the Great Northern Railway, the starting-point of which is fixed at the coal-port of the north. The first part of the course of the railway is through and by the coal-fields of the district, and at the same time it is, throughout nearly the whole of its completed course, in close proximity to the rich agricultural districts already referred to. Passing the Maitlands, the line proceeds on to Singleton, a town about half-way between West Maitland and Musswellbrook. After running up the valley of the river for about eighty miles, the railway is carried over it at Singleton by means of a bridge, built at a cost of some £50,000. fairly be looked for. The plains are well watered by tributaries of the Hunter, and upon every creek, under pleasantly placed clumps of trees, and, indeed, in every direction, comfortable homesteads are to be found. From Singleton the Great Northern Railway runs on to Muswellbrook, the country retaining its appearance of quiet, homely comfort the whole way. At Aberdeen the line is again carried across the river by means of a substantial bridge. By the time the railway reaches Aberdeen the character of the country changes. Instead of the long level plains, the rich river banks, and deep beds of loam, mountains and hills combine to give a character to the scene. From Aberdeen the railway will be carried on to Murrundi; and although the country through which it will pass is mountainous, many parts of it are admirably adapted for cultivation, and it is tolerably well settled. Two years after the opening of the line to Musswellbrook, the extension to Scone was, on the 18th April, 1871, formally opened by Lord Belmore, the governor of the colony. This extension not only opens up a considerable extent of coal-bearing country, but places the agriculturists of the Kingdon Ponds Plain within cheap and easy communication of the markets of Newcastle and Sydney. Macleay River towns; but neither of them are of any very great importance. The sugar-cane has been profitably grown on the banks of the Macleay, and heavy crops of maize are common. The mountains are lofty and the scenery wild ; but alluvial flats are plentiful and easily brought under cultivation. In some places the ridges of rocks run straight out from the mountains and close in the banks of the river, forming ravines and chasms of an extraordinary and wild beauty. Strange flowers abound, and flowering shrubs grow out of the fissures of the rocks that overhang the water. After the Macleay comes the Clarence, a still more important stream, draining an area of 8,000 square miles, and running a course nearly 250 miles long. The Clarence empties into the Pacific about 300 miles north of Sydney. For nearly 70 miles above its mouth it has an average breadth of nearly half a mile. Near and around its head-waters and its tributary streams, rich mineral deposits have been discovered, and several gold-fields worked. Grafton, the principal town of the river, is situate about fifty miles up the stream, which is navigable for 30 miles beyond this point. Ships drawing ten feet of water have no difficulty in getting up to Grafton, and from the port a very large portion of the produce of an exceedingly rich pastoral, agricultural, and mining district is conveyed to the sea-board and to the neighbouring colonies. Nearly all the settlement is on the banks of the river and in the valleys running clown from a not very elevated range of hills a little distance away. A low-lying and isolated series of hills, called the Coal Range, runs in an easterly and westerly direction, some miles to the north of Grafton, and the only roads from Tenterfield to the latter township are through the gaps of these mountains. As may be understood from the name, coal, though not in very considerable quantities, has been found in the hills. The plentiful supply of firewood everywhere to be met with has had the effect of directing attention from the coal deposits of the district. A long-stretching, low, sandy, and scrub-covered coast leads from the mouth of the Clarence to the Richmond River, distant thirty miles, or thereabouts, farther north. Here and there a ridge of sandstone breaks the tiring monotony of the scene, and in some places signs of settlement are met with; but, on the whole, this part of the Australian coast presents a melancholy view to the travellers along the coast by sea. Sometimes the blue ridges of the Dividing Range may be seen, but the distance is too great for any of their features to be distinctly recognised. Here and there a trifling indentation in the land gives variety to the view, but in no instance does it rise above the most ordinary appearance of a low-lying sea-coast. The traveller who makes the journey ashore, parallel with and a few miles from the coast, although he would have more difficulties to encounter than the sea voyager, would meet with objects of far more interest. The swamps and lagoons, round which he would have to make his way, have upon their borders vegetation so luxuriant that the term sub-tropical may with all propriety be applied to it. Strange birds and stranger flowers continually present themselves. Whenever the ground rises from the ordinary level of the country, objects of interest increase in number, the waters of the creeks flow over, if not golden sands, strange pebbles, and by basalts carpeted with flowers, having perfumes as sweet and colours as bright as the world can show. The birds build their nests after fashions that would seem to indicate a knowledge of a want of necessity on their parts of conforming to the ordinary routine of the bird world in other places; their eggs are more strangely marked and coloured than elsewhere, the slenderest stem serves for a lodging place, and the nest itself is of the most frail character possible. Lizards that shimmer and shine with a thousand mys of purple and gold run up and across the paths, wholly heedless of man, whilst the long dull-looking iguana hangs from the bark of trees and stares through vacancy at a world of which the traveller knows not, but upon the residents in which the strange creature lives and enjoys himself. rise and run for a considerable distance to the west, and then join the main Dividing Range of the continent. The belt of country lying between the Blue Mountains and the sea, and stretching northwards from Port Jackson for nearly 400 miles to Point Danger, has, with few exceptions, been settled within the last twenty-five years. The earlier settlements are nearly all to the west and south-west of Sydney, and, singularly enough, some of the most beautiful country of the whole continent is to be found in the first discovered and cultivated districts.